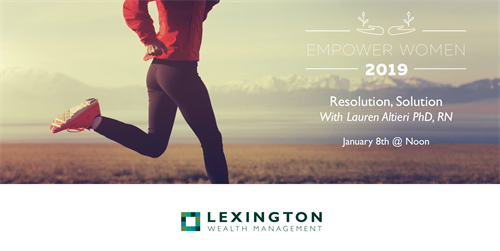 To kick off our 2019 Empower Women Series please join us as Lauren Altieri presents Resolution, Solution. In this workshop, she will explore the meanings of health and wellness with a focus on what that means for you. During our time together, you will have opportunities to learn individually and together, how to develop a plan to achieve the area of wellness that is meaningful to you. Lauren Altieri PhD, RN and Functional Medicine Health Coach (Certification, Feb 2019) will be facilitating this workshop. Beyond her traditional education, she has taken courses in lifestyle medicine, mind-body medicine as well as healthy cooking, yoga and, mindfulness. After working in a variety of roles in the traditional healthcare model Lauren is returning to her roots to help others attain their goals toward better health and wellness. She is skilled in motivational interviewing and helping others find their own best solutions. We look forward to seeing you on Tuesday, January 8th at noon.